Home / ENTERTAINMENT / The Kardashian family are planning to expand their wealth with an animated TV series which will feature the whole family except Caitlyn Jenner. According to TMZ, Kim had a meeting with Harvey Weinstein's company in Los Angeles to pitch the idea. 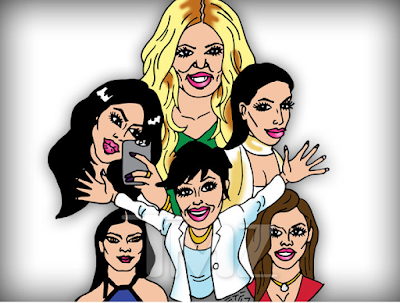 Read TMZ report below: "Kris Jenner is pitching a animated television series featuring cartoonie Kim, Khloe, Kylie and the rest of the fam. We've learned Kim had a meeting with Harvey Weinstein's company in L.A. earlier this month to pitch the show. We're told "the entire family" will be featured ... we're told it will not include Caitlyn. Our sources say this is a primetime pitch ... and not for kids".The Kardashian family are planning to expand their wealth with an animated TV series which will feature the whole family except Caitlyn Jenner. According to TMZ, Kim had a meeting with Harvey Weinstein's company in Los Angeles to pitch the idea. Read TMZ report below: "Kris Jenner is pitching a animated television series featuring cartoonie Kim, Khloe, Kylie and the rest of the fam. We've learned Kim had a meeting with Harvey Weinstein's company in L.A. earlier this month to pitch the show. We're told "the entire family" will be featured ... we're told it will not include Caitlyn. Our sources say this is a primetime pitch ... and not for kids". The Kardashian family are planning to expand their wealth with an animated TV series which will feature the whole family except Caitlyn Jenner. According to TMZ, Kim had a meeting with Harvey Weinstein's company in Los Angeles to pitch the idea. Read TMZ report below: "Kris Jenner is pitching a animated television series featuring cartoonie Kim, Khloe, Kylie and the rest of the fam. We've learned Kim had a meeting with Harvey Weinstein's company in L.A. earlier this month to pitch the show. We're told "the entire family" will be featured ... we're told it will not include Caitlyn. Our sources say this is a primetime pitch ... and not for kids".The Kardashian family are planning to expand their wealth with an animated TV series which will feature the whole family except Caitlyn Jenner. According to TMZ, Kim had a meeting with Harvey Weinstein's company in Los Angeles to pitch the idea. Read TMZ report below: "Kris Jenner is pitching a animated television series featuring cartoonie Kim, Khloe, Kylie and the rest of the fam. We've learned Kim had a meeting with Harvey Weinstein's company in L.A. earlier this month to pitch the show. We're told "the entire family" will be featured ... we're told it will not include Caitlyn. Our sources say this is a primetime pitch ... and not for kids". "Kris Jenner is pitching a animated television series featuring cartoonie Kim, Khloe, Kylie and the rest of the fam. We've learned Kim had a meeting with Harvey Weinstein's company in L.A. earlier this month to pitch the show. We're told "the entire family" will be featured ... we're told it will not include Caitlyn. Our sources say this is a primetime pitch ... and not for kids".